Varsha Enclave is a group of Serviced Apartments in Mysuru, where we aim for our guests to experience the epitome of hospitality and tranquillity. We mainly believe in the saying “Atithi Devo Bhava” which means the guest is equivalent to God. “Amazing place to stay in Mysore”. Really super hospitality. Its in a good location away from the regular traffic. Room service excellent. The view from the flat is too good. There is a sit out for every flat which is very good for a peaceful coffee in the morning and evening. I will definitely recommend to all my friends. The place is very neat and spacious , the management is very friendly and helpful. i am very happy with varsha enclave and stayed there for 1 week . And the place is effordable. Best place to stay in mysore . Awesome experience. Hospitality at its best! Real value for money. Best locality in Mysore. Way to go!! Hats off!! Best place to stay with family. I booked 2 rooms, flats were clean and modern! Good parking facility. Had a couple of business visits to Trinity house this year. Located in a calm environment & very near to the famous places in Mysore .Well maintained new property, service is excellent. We stayed at Varsha Enclave for a night while going to Coorg from Bangalore (with extended family). Rooms are neat and clean and stay is pretty comfortable and its value for money. Staff is also very polite and helpful. It is a very pleasant experience, they have 3 properties in Mysore and all of them are well serviced. 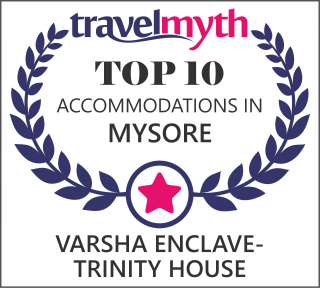 The location is good, the management is friendly and so are the service staff, I have been to Mysore for more than a dozen times now and every time my stay had been with Varsha Enclave. If you are in Mysore on a yoga trip this place is for you. Its right next to Saraswathi’s shala, 5 min walks from the main KPJAYI shala and close to the other shalas too. The accommodation is very comfortable and clean. The staff is extremely helpful and friendly. I would recommend this place both for a short and long term stay.